Acts as diuretic and urinary antiseptic, stimulates the appetite, inhibits the production of dihydrotestosterone, a hormone that contributes to enlargement of the prostate, is good for poor appetite and prostate disorders, may also enhance sexual functioning and desire. Acidifies the urine and prevents bacteria from adhering to the bladder, is helpful for infections of the urinary tract. Two of the most common prostate problems are prostatitis and benign prostatic hypertrophy, or enlarged prostate. Prostatitis, common in men of all ages, is the inflammation of the prostate gland, the usual cause is infectious bacteria that invade the prostate from another area of the body. Hormonal changes associated with aging may also be a cause. 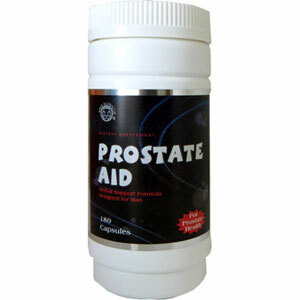 Prostate Formula contains Vitamins A, E, B6, Zinc, Prostate Extract, Glutamic Acid, Glycine, Alanine, Bromelain, Saw Palmetto Extract, Bee Pollen, Cranberry Extract, Barley, Gingko Biloba Extract, Goldenseal Root Extract. Vitamin A and E are potent antioxidant and immune system enhancer. B6 has anticancer properties. Deficiency has been linked to prostatitis, and even prostate cancer, Zinc gluconate is for best absorption. Amino Acid is needed for maintaining normal prostate function. Saw Palmetto acts as a diuretic and urinary antiseptic, stimulates the appetite, inhibits the production of dihydrotestosterone, a hormone that contributes to enlargement of the prostate, is good for poor appetite and prostate disorders, may also enhance sexual functioning and desire. Cranberry extract acidifies the urine and prevents bacteria from adhering to the bladder, is helpful for infections of the urinary tract, and a good source of Vitamin C.
This product does not contain wheat, salt, sugar, milk, yeast or preservatives. This product has been formulated with the highest quality materials available. Other inactive ingredients: Stearic acid, Magnesium stearate, Silicon dioxide, Microcrystalline cellulose, Dicalcium phosphate. Maintains normal prostate function, acts as diuretic and urinary antiseptic, stimulates the appetite, inhibits the production of dihydrotestosterone, a hormone that contributes to enlargement of the prostate, is good for poor appetite and prostate disorders, may also enhance sexual functioning and desire. Acidifies the urine and prevents bacteria from adhering to the bladder, is helpful for infections of the urinary tract. Directions: Adults take 2 capsules daily.